A destination where the epic memories of the Battle of Dien Bien Phu still resonates, Dien Bien now becomes a favorite destinations for many Vietnamese and foreign backpackers. 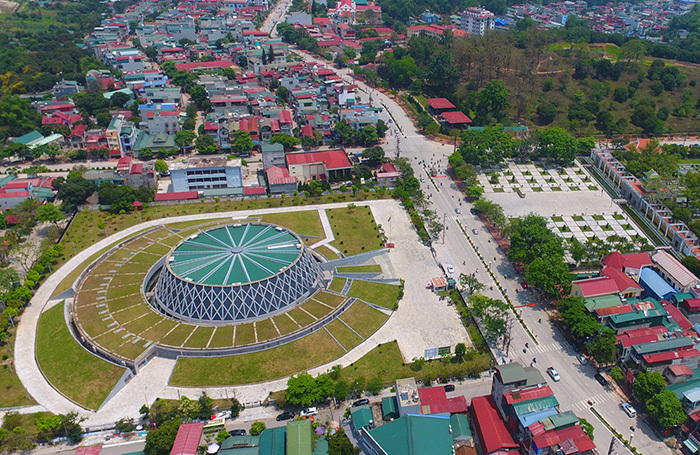 Although the war has receded for decades, the story still remains in many historical heritages in Dien Bien, such as Independence Cemetery, A1 Hill, French Bunker, Dien Bien Phu Victory Headquarter, Monument and Museum. Dien Bien is also renowned for its enchanting natural beauty of Muong Thanh Rice Terrace, Pa Khoang Lake, Pha Din Hill, Pa Thom Cave and Xa Nhe Cave. 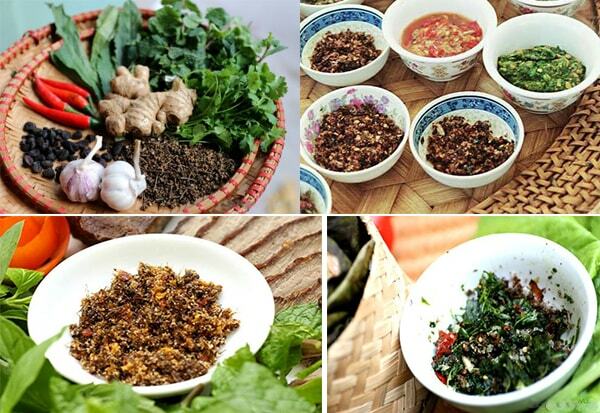 Come to Dien Bien, you will also have the chance to feast on many exotic food that can only be found in Vietnam’s North Western Region. Dien Bien Phu is located in Muong Thanh Valley which is approximately 20km long and 6km wide. this city is 35km from the Laos border and 474km to Hanoi. 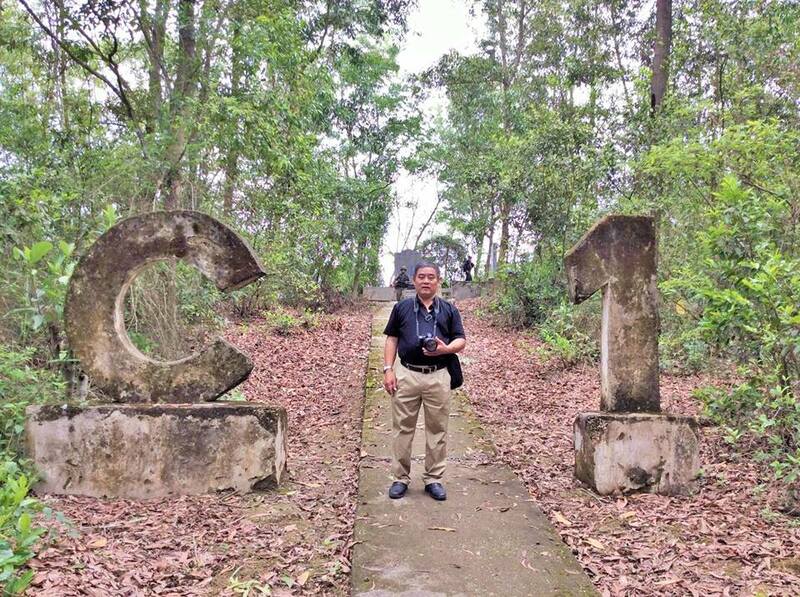 This was a battlefield between the Viet Minh Army and French Army in 1954. The result was the French in Indochina was cut and Viet Nam was divided into two parts: North and South. 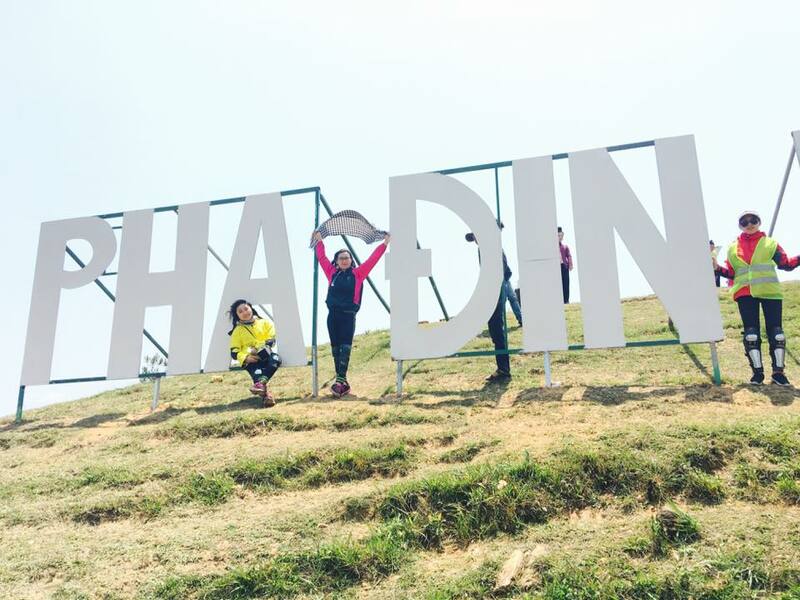 Nowadays, Dien Bien Phu became one of the tourist attraction sites for many local and international tourists. The major attraction is the battlefield, its associated museum and relicts, and more recently, the largest statue in Vietnam erected to commemorate the 2004 anniversary. It is noticeable that for the adventurous visitor, this is an attractive center for majestic scenery and an access point for encounters with wide variety of ethnic minority groups that have hardly been touched by tourism. At 5 p.m, March 13, 1954, we opened fire, starting the Dien Bien Phu campaign. The fight took place fiercely right at the beginning and it was divided into three stages. The first stage (from March 13 to March 17, 1954): We held the Him Lam, Doc Lap, Ban Keo strongholds. They was strong defense obstructing the access from Tuan Giao and Lai Chau into Dien Bien Phu. The second stage (from March 30 to April 30, 1954): We attacked the strongholds in the east of the central quarter. The fight took place vigorously. We had to fight for a single piece of land. The third stage (from May 1 to May 7, 1954): We won the rest positions in the east and wiped out the whole Dien Bien Phu stronghold. At 5 p.m, May 7, 1954, the French General de Castries and his staff of officers at this stronghold were captured alive and it was the time when the flag “Quyet chien quyet thang” (determined to fight and win) was flown from the top of the commanding bunker of the enemy. At the end of the campaign, we killed and captured 16,200 enemies, shot at 62 planes and confiscated all weapons of the enemy. 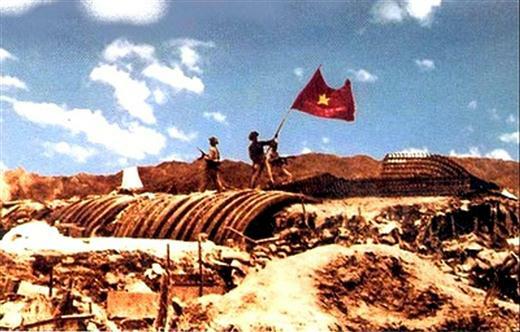 The Dien Bien Phu historical victory contributed to the success of the resistance war against the French colonists and the liberty of Northern Vietnam air travel. 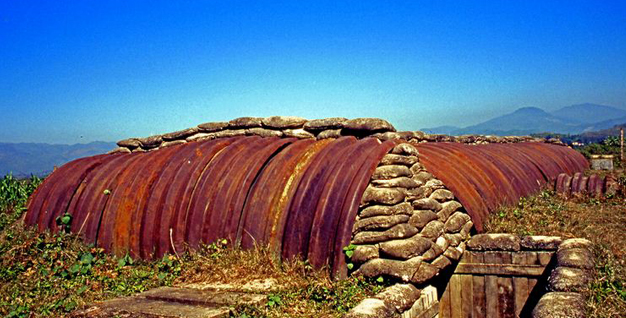 One of three camps that was defeated right at the beginning of Dien Bien Phu campaign on March 13, 1954. The most important camp of the French colonists in Dien Bien Phu. Here, our soldiers and the French colonists fought for a single piece of land. After fighting fiercely for 56 days and nights, we seized the camp in the evening of May 6, 1954. 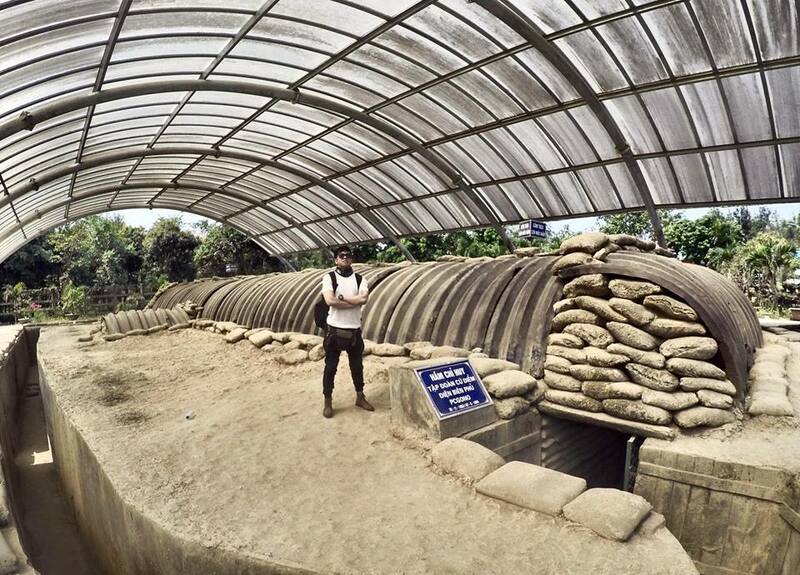 The commanding bunker of the French General De Castries and the staff at Dien Bien Phu stronghold. The original shape and size, structure and arrangement of the bunker are kept intact. Strongholds to protect the central region of the enemy where many fierce fights took place. Atop Hill D1 stands the Dien Bien Phu Victory Monument. Built in1984 during the year 30th year after Dien Bien Phu Victory. In the end of 2003, it was upgraded and divided by 5 displayed areas. Now there are 274 objects and 122 photos due to each subject to describe about the Dien Bien Phu campaign and Dien Bien Phu of the present. Located in a primitive forest in Muong Phang commune of Dien Bien district. It is about 25 km from Dien Bien Phu city towards the east. There are many historical relics here such as the commanding bunker of General Commander-in-chief Vo Nguyen Giap and Hoang Van Thai, the working house of the command, etc. Built in the centre of the Ban Phu Citadel (Chieng Le Citedal) to worship Hoang descent line and 6 leaders of the insurgent army. It is an important cultural and historical relic in the local to worship the great devotion of Hoang Cong Chat general, a farmer hero, who was born in Thai Binh province, in the resistance war to protect Muong Thanh (Muong Then) from the occupation of Phe enemy. Besides, the temple is also a worshipping place of the local people on the full-moon day, the New Year festival, especially in the traditional festival on the 24 – 25 of the second month of every lunar year. Locates in Muong Phang commune, Dien Bien district. 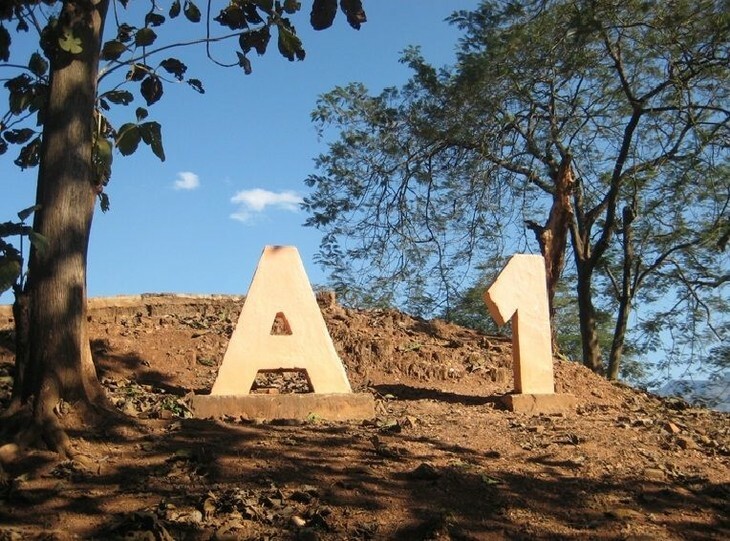 Its position is very convenient, near the road 279, about 20 km from Dien Bien Phu city, linking Dien Bien Phu city with Muong Phang historical and cultural forest where the relics of the Command of Dien Bien Phu campaign remains. 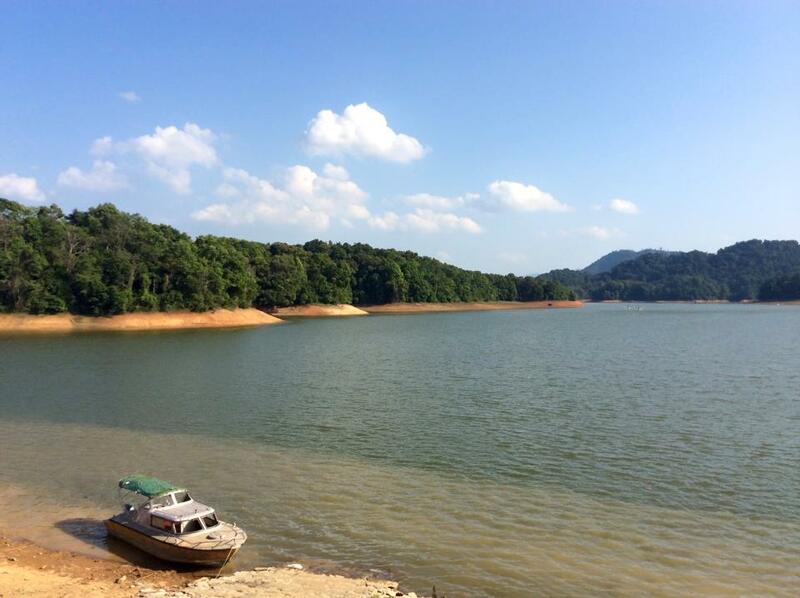 The lake is lying in the centre of ranges of mountains, in a place of beautiful natural sceneries. In spring, mist covers the mountains and small houses which create a mysterious picture. In summer, the weather is quite nice with blows of cool wind. Visitors can enjoy the natural beauty in the distance or row a boat for sight-seeing. All makes a peaceful and romantic picture that is attractive to visitors and tourists. In the lake region, there are the villages of Thai and Kho Mu ethnic groups who still follow traditional customs and habits of ethnic groups in the North West of Vietnam. Located 1,000m above sea level. Pha Din means the earth and the sky in the language of the Thai ethnic group. The pass is full of twists and turns, one side is a upright cliff and the other is a deep gulf. Therefore, visitors will have a chance to enjoy the natural landscape in the north-west area. Located in Bung Lao commune, Tuan Giao district. It is an ancient cave, deep and wide, about 1,000 meters high with many narrow paths. Coming here, visitors have chance to see in their own eyes a number of stalactites in various shapes which look like such animals as dragons, phoenix, lions, elephants, and beautiful orchids. The local people have found out many historical remains such as axe, stone pestle, and fossil bones. 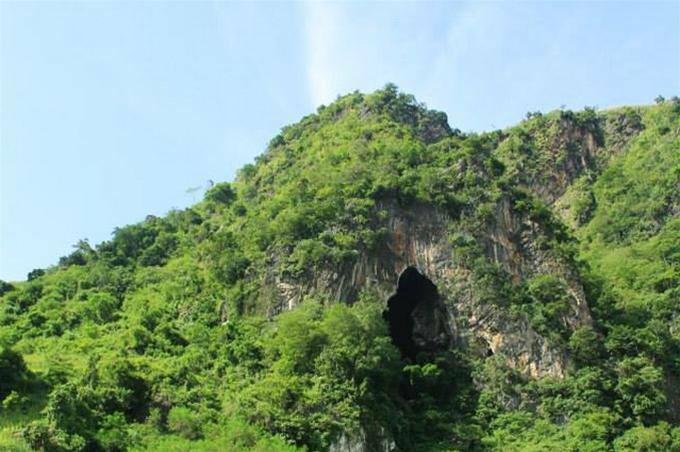 Tham Pua Cave is also the first Commanding Unit of The Dien Bien Phu campaign. It is the place where the decisive meeting for the Dien Bien Phu campaign was held on January 14, 1954. Coming to Vietnam airtravel, you will satisfy with every flight of Vietnam Airlines. The economy class provides comfortable seats, 32 inch between 2 rows. Devices includes pillow, blanket and other necessary devices. The airline has also added a handy ‘tablet tray’ beneath each seat’s inbuilt screen onto which passengers can perch a tablet or even a large-screen smartphone for watching videos. Passengers can require sticker “Please do not disturb me” or “ Call me up for meal” if needed. The landscape of Tuy An has always been so inspiringly picturesque that even the paradise dwellers chose the place for poetic recital parties. They brought countless number of precious plates and gold cups to this shore line for the heavenly indulgence. Once, after one such godly pleasure time, they flew away to find more beautiful places. Suddenly, the stacks of plates and cups turned into rock poles. That is one of the three legends about the Sea Cliff of Stone Plates at An Dong Commune, Tuy An District, Phu Yen Province. 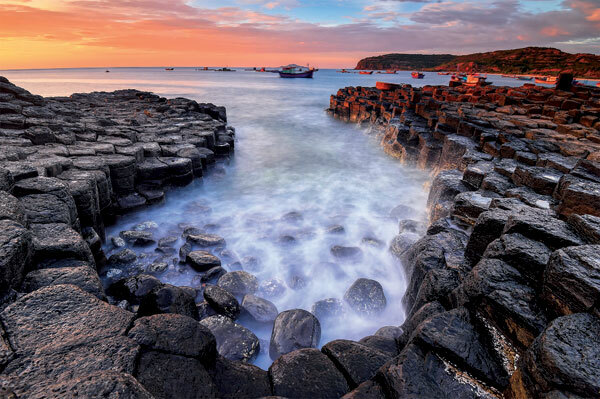 Along the 3,000km shoreline of Vietnam air travel, there are many world-renowned beaches such as Lang Co, Danang, Phu Quoc, and mesmerizing perilous rocky protrusions like Co Thach (Binh Thuan), The Queen (Binh Dinh) or The Jumping Rocks (Quang Binh). But the Sea Cliff of Stone Plates is the only rock formation recognized by the Vietnamese government as a National Natural Treasure. From Tuy Hoa city downtown (Phu Yen Province), we went 31km north on 1A national highway to Ngan Son fork, turned right to a two-lane road and went 13km more, and there it was, the illustrious Sea Cliff of Stone Plates. From a distance, it looked like a colossal bee hive hidden in a desolated bay. Wave after wave rushed on it with open arms as if for a tight hug, and then broke into dazzling white foam. Washed and cleansed by sea water for millions of years, the black rock piles shine bright under the blazing sun. Official records say that the Sea Cliff of Stone Plates field is 200m long and 50m wide. Seen up close, the piles are actually stone pillars standing up straight side by side as if planted. Almost all the pillars have flat pentagonal or hexagonal of almost the same size, about 30cm in diameter, like stacks of dish plates. Perhaps that’s why local people call this natural rock formation the Sea Cliff of Stone Plates. They are arranged by heaven, so tidy,’ 76 year old elder Tinh, who lived near the cascades, exclaimed. Indeed, compared to the rocky reefs lining the deeply blue bay, the Sea Cliff of Stone Plates look even more impressive. According to the scientists, about 200 million years ago, volcanic activity oozed lava into the sea. The sudden change of temperature caused the lava to harden and crack, creating the miraculous formation. In recent years, the otherworldly beauty of the Sea Cliff of Stone Plates has attracted not only a lot of tourists, but also photographers. The unusual rock formation and the continual subtle change of colours and light caused by the waves and the sun make them feel unique. ‘Nowhere else does the black colour look as majestic as these rocks in the first rays of dawn. And strangely, at dusk, the plates shine pink. It’s fascinating to see the vigour of the ever-moving silver mane waves melt away when meeting the silent Sea Cliff of Stone Plates,’ a photographer named Trung said. The salt fields at Phan Thiet City, Binh Thuan Province, South-Central Vietnam air travel, have long been an infinite source of inspiration for poetry, music, arts and cinematography. 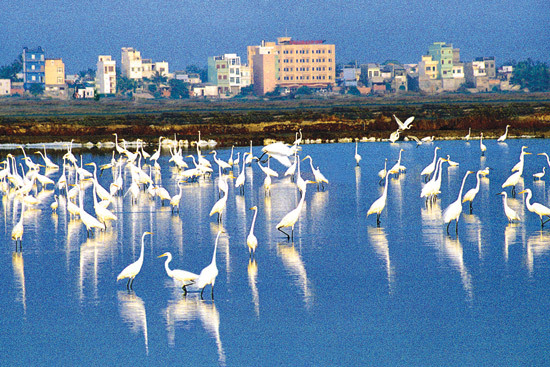 My story of flocks of storks reflected on the salt fields of Phan Thiet began in 1999. It all started in March of that year, when I began the practice of taking pictures of wild animals. I lived in Phan Thiet, and had to take my child to school at five a.m. every day. We went along the salt fields, and I noticed one of the storks’ strange habits. From five to six a.m., just before sunrise, hundreds of storks gathered on the salt fields. But at about seven, when the sun was up, there were only a few of them left. Where did they go, and why? Every day, more and more of them gathered there. I decided to bring my camera each morning. At six, when my kid was in class, I came back to the salt fields. The first day, when I came within about 200 metres from them, they flew away. The next day, I came to the same spot and stopped. I stood there till seven, when the siren announced working time. They flew away one by one, and I went to work. The third day I came closer, about 180 metres from them, and they paid no attention to me. I continued advancing day after day until I was standing about 50 metres from the storks, free to photograph them while they went on chit-chatting carelessly. Once, while I was deep into photography, the birds suddenly panicked, because a man came within about 100 metres from them. So they were afraid of the man, not of me. Why? It rained one night in May. The next morning, I came with my usual enthusiasm to carry on with my photography. But strangely, on that day and many days after that, on the salt fields there were only a few lone storks, and they didn’t gather together. I was able to understand why only many months later. Why were the birds not afraid of me, but of someone else who was over 100 metres from them? Because during the two months I followed them, I always wore the same green uniform, repeating the same movements that caused no danger. They found me harmless and got used to me. Why did they gather only from five to six a.m. and flew away when the sun was up? It’s because there are two kinds of salt fields. One holds sea water, the other makes salt. March, April and May are the hottest, dryest months of the year. The water holders dry out quickly. The fish surface more often to get air and the water is shallow. That is a festive time for the birds, for the eating is good. When the sun is up, the field’s surface is like a mirror. The reflection makes the water hot, forcing the birds to go looking for food elsewhere. So, to take pictures of the stork flocks on salt fields, photographers have to come there during March, April and May, work before sunrise, and know how to make friends with them, just as I did. If one misses the opportunity, after just one rain, the water level will go up, and the birds won’t return until the next year. 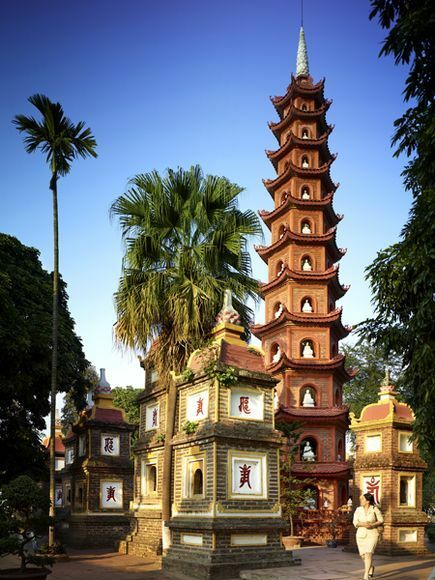 Tran Quoc is the name of Hanoi’s oldest and most sacred pagoda. Nearly 1500 years old, it used to receive kings in Buddhist memorial days and host famous Buddhist monks who came here to practice their religion. 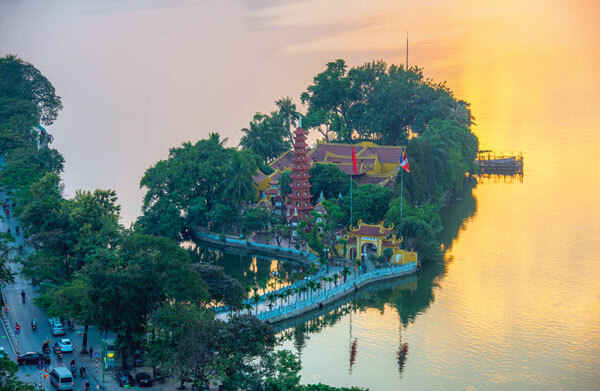 Occupying a promontory at the northwest corner of the West Lake in Yen Phu ward, West Lake district of Hanoi, Tran Quoc has been officially recognised as a national relic of history and culture since 1989. According to the Vietnam air travel Cultural Heritage Dictionary, ‘Originally named Khai Quoc (meaning ‘Nation Founding’) Tran Quoc was built during King Ly Nam De’s (544–548) reign in Yen Hoa Village. In 1615, it was moved to what used to be the foundation of Thuy Hoa back hall and Han Nguyen Palace near Yen Phu dyke, the previous Kings’ favourite place for fishing and relaxation. From 1624 to 1639, Khai Quoc was continually expanded and later King Le Hy Tong renamed it Tran Quoc. The beginning of the Nguyen Dynasty (1802- 1945) the pagoda was renovated and acquired a bigger bell and Buddha statues. In 1821, King Minh Mang visited it and gave 20 silver taels for its renovation. In 1842, King Thieu Trị also visited Tran Quoc and contributed one big gold coin and 200 quan (the currency of the time).’ Tran Quoc was like a spiritual anchor for the nation and its kings. Historical texts also recorded that Tran Quoc had hosted famous Buddhist monks such as His Venerable Khuong Viet Chan Luu and High Zen Priests Van Phong, Thao Duong, Thong Bien, Giac Quan and Quang Te. Having been renovated multiple times, Tran Quoc architecture shows ‘harmonious continuity between historical eras,’ as noted by cultural experts. The main architectural units of Tran Quoc pagoda includes the Front Hall, Incense Ward, Upper Edifice, Bell Tower, Ancestral Shrine and House of Steles. The experts don’t mention much about the carvings and artwork at Tran Quoc. They simply remark that ‘some details are painstakingly well done.’ About the overall architectural and scenic values of the pagoda, the general opinion is that the antic solemn structures in sternly strict arrangement according to the ancient Buddhist rules and the dreaminess of the West Lake highlight each other well. Perhaps that’s why the British Daily Mail ranks Tran Quoc among the world’s 15 most beautiful Buddhist pagodas. Having witnessed so many historical ups and downs, the pagoda preserves valuable artefacts, such as the statues in the Upper Edifice, especially the one of Shakyamuni Buddha entering Nirvana, unique and meticulously made in a distinct fashion. 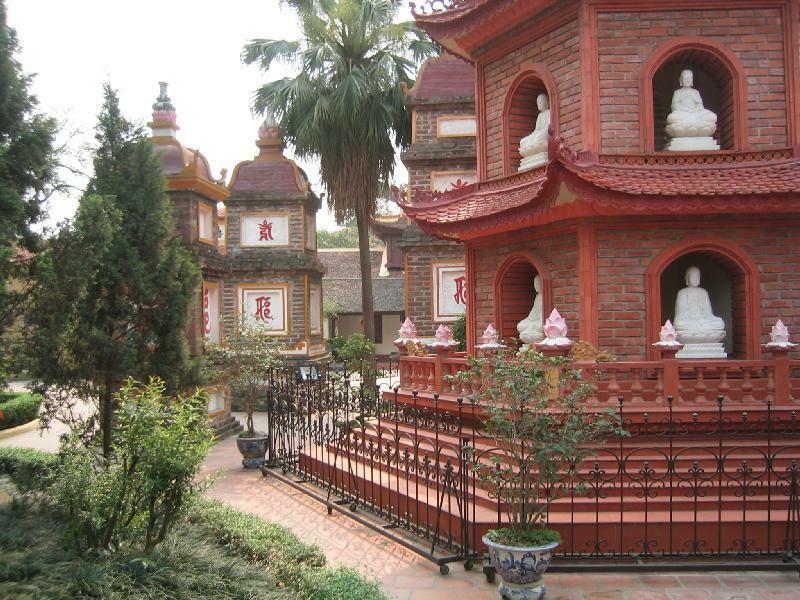 The 14 steles with engraved texts about the foundation and history of the pagoda, including the steles of famous scholars Nguyen Xuan Chinh (1587-1693) and Pham Quy Thich (1760-1825), are also considered highly valuable. Behind the pagoda’s entrance is a ‘garden of towers’ with many old and new towers. Most attention is drawn to the 11-storey, 15m-tall Six Heaven Tower that houses many Amitabha statues made of precious stones, with 9 layers of stone carved lotuses at the top. Amid the 500ha of West Lake, the pagoda’s 3000 m2 garden stands prominently under the shade of many tree species such as mountain pomegranates, longans, willows, etc. Buddhists revere the banyan tree planted by President Rajendra Prasad of India when he visited Tran Quoc in 1959. Quan Chuong is one of the Eastern gates of the earthen fortification that surrounded the Thang Long Citadel. Built in the 10th year of Le Canh Hung reign (1749) and renovated in the 3rd year of Gia Long reign (1817), it remains intact until today. This is one of the 21 gates of the old Thang Long Citadel, a national relic, ranked in 1995. Today, almost all the other gates are only remembered by names borne by some geographical entity that stands on their place, or by historical records. 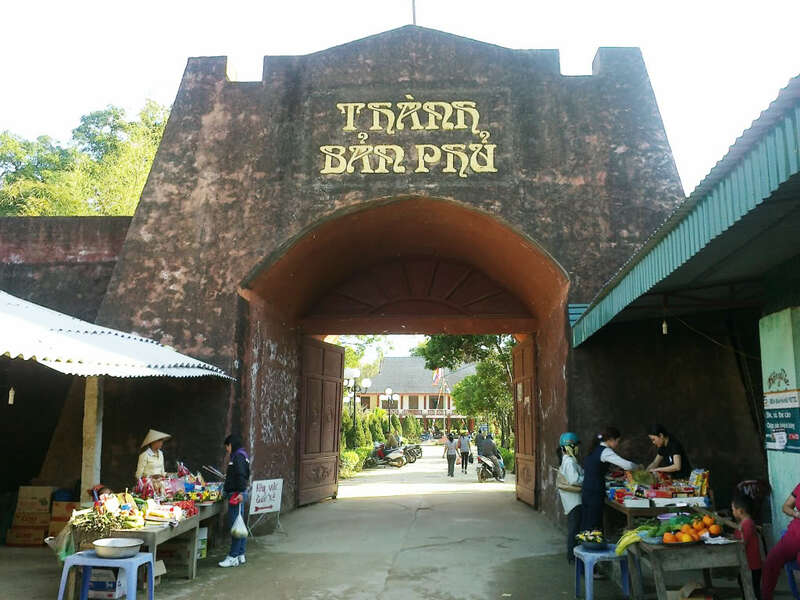 For example, Cho Dua Gate is now the name of a bazaar, and Cau Giay Gate was known as the name of a brick bridge that crossed To Lich River, without having anything that reminded one of the ancient structures. Fortunately, Hanoi still has an almost intact gate; Quan Chuong. Located at an end of O Quan Chuong Street, Quan Chuong Gate opens to Red River dykes and Hang Chieu Street behind it. It has cupola form, with a watch tower at the top. The palate form gate used to have double thick wooden doors which closed at night and opened early in the morning for people to go into and out of town. 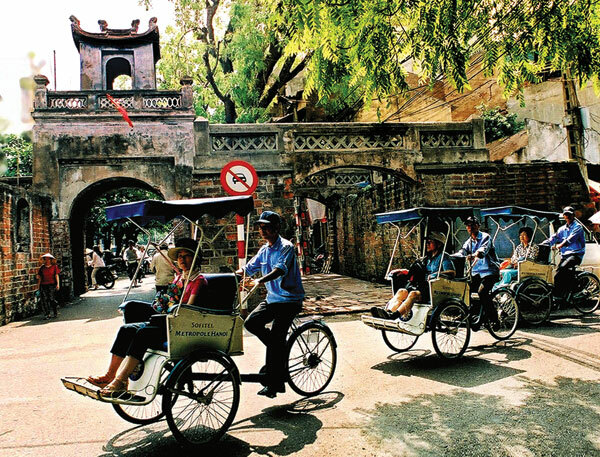 Through ups and downs of history, Quan Chuong Gate still stands solemnly, preserving for Hanoi a simple but precious structure that witnessed times of peace and war. That was the gate’s original name, because it opened to Thanh Ha Village on the bank of To Lich River, where it poured into Red River. The village covers the area of Hang Chieu, Thanh Ha and Dao Duy Tu Streets today. The gate took the form we see today in 1817 during a major reconstruction. At the time, it was still called Thanh Ha Gate. Quan Chuong was the rank of an officer in charge of the city guards. On Nov 20, 1873, the French attacked Hanoi for the first time. Warships coming upstream from the sea brought fire power and strong troops, who immediately stormed the gate. Quan Chuong and over 100 city guards fought fiercely until the last one fell. Since then, Thanh Ha Gate has been named Quan Chuong Gate. Having taken Hanoi, the French ordered the destruction of old structures to expand the city. Almost everything around was leveled. But the Quan Chuong canton chief Dao Dang Chieu had led the local people’s campaign against the destruction of the gate. They resolutely refused signing the agreement which would have made the destruction legitimate. It’s because of their strong will that the city retained an invaluable relic of architecture. In 2009, the United States donated $74,500 to Vietnam for the preservation of Quan Chuong Gate. US Ambassador to Vietnam Michael W. Michalak said, ‘Quan Chuong Gate is an astoundingly beautiful architectural relic being eroded by time. It is not simply a landmark gate of the ancient Thang Long citadel, but also a symbol of the spirit and resiliency of the people of Hanoi. Dien Bien is a mountainous border province in the northwestern region, 500 km west of Hanoi; bounded by Lai Chau province to the north and Son La province to the east and north-east, Yunnan province of China to the northwest; to the west and southwest by the Lao People’s Democratic Republic. Dien Bien province is rich in tourism potential, especially its culture and history. The most prominent is the historic Dien Bien Phu victory system, including Dien Bien Phu – Muong Phang campaign headquarters; Him Lam, Ban Keo, Doc Lap; The hills A1, C1, D1, E1 and the center of the conglomerate of France (De Castries Tunnel). This relic is a precious resource for tourism development for Dien Bien province and the Northwest area also. Visit Dien Bien on the occasion of Dien Bien Phu Victory Day 7th May to enjoy the happiness of Dien Bien people in this special occasion. Around the third month of the calendar is the season of camel’s foot flowers (kachnar) blossoming on all over of northwest area. In December, along the 2 sides of the National Highway No.6 to Dien Bien is fulfill by the yellow of Japanese sunflower bloomed. Around August 8-9 to see rice crop sightseeing in some other areas. 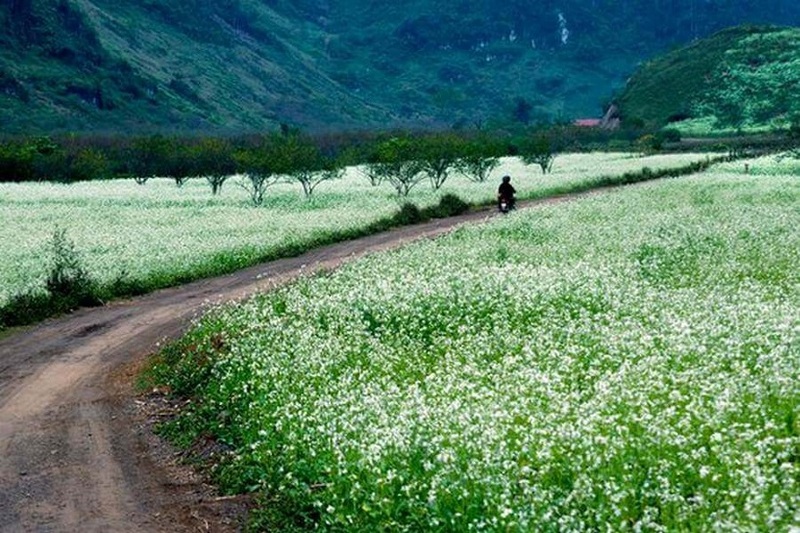 In November as white mustard flowers bloomed everywhere in Moc Chau. Sleep bus to Dien Bien daily run at My Dinh Bus Station in Hanoi, duration from 12-13 hours. Traveling by sleep bus has the advantage of being able to send a motorbike. If you dont want to go by bus, taking a motorbike is a good idea to travel from Hanoi to Dien Bien for a whole day to take the distance of 500km. Currently Vietnam air travel is the only airline to operate the route of Hanoi – Dien Bien, the aircraft used for this flight is ATR 72. Round trip fare is about 2,8 mil VND. There are 94 hotels in Dien Bien province operating with nearly 1400 rooms. In which 7 hotels are rating from 1- 4 star standards. Most of the rest are standardized to serve tourists, so you have many choices when traveling to Dien Bien. The purpose of tourists to Dien Bien is to visit the old battlefield, re-examine their perceptions of human resources tourism to enrich their knowledge. The intangible cultural heritage of Dien Bien province is also outstanding to develop tourism with a long history of formation, with 21 ethnic groups living. This is reflected in customs, habits and festivals of ethnic minority people with festivals such as the typical festival of Ban Phu Citadel is held on 24th – 25th February of the lunar calendar, to tribute to the hero Hoang Cong Chat and two local leaders of General Ngai and General Khanh who led his people to successfully expel foreign invaders. The highlight of the ceremony is Xen Ban ceremony to pray for a year of good weather, fresh crops, people get a comfortable life, well-off and happy. Thai people also have many other typical festivals such as Xen Phan Be (goat head cutting), Kin Pang Then (offering heaven); Kin Khui (release of bad luck)…. At the markets in Tua Chua district, people to the market with the purpose of trading and enjoy the market and meeting their friends. 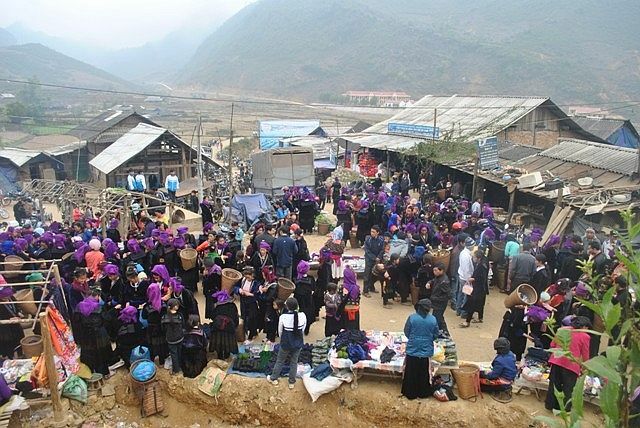 Tua Chua has 3 main markets of Muong Bang, Xa Nhe and Ta Sin Thang. In the busy market atmosphere, couples find each other. They have used the leaves flute, lips flute to sent love, confession and get together. They gave each other bracelets, mirrors to believe. The meeting in this spring is the bridge give many boys and girls become wives and husbands. Around 1840, as the Nguyen Kings banned Christianity in Vietnam, the Western missionaries moved to the faraway highlands in Kon Tum Province on the Mid-Vietnam plateau. From Hue Capital through lowland provinces to Kon Tum, they took the 120km long, so-called ‘salt, ceramics and gongs’ trading route. The stretch of road from Quang Ngai to Kon Tum at the time was very desolate, bumpy and perilous. To evangelize the rustic highland tribes of Kon Tum, the first thing the missionaries did was build a primitive church from trees and leaves. Without knowledge of local languages and customs, they had a lot of troubles. However, with perseverance and patience, the Western missionaries have managed to introduce Christianity to the ethnic minorities here. In 1913, as more people began turned Christian, Brother Joseph Décrouille, head of Kon Tum parish, decided to build a more robust church. He mobilized the parishioners and their elephants to gather necessary hardwood from the forest. Having amassed a large amount of wood, he invited famous carpenters from the lowlands to work with local masters. In 1918, the 500-seat wooden church was completed. Since then, the wooden church had survived two long bloody wars and the harsh Kon Tum weather. In 1995, the wooden church was expanded to double the old capacity. The old and new parts matched well, and the whole structure looks like a huge cross. Today, Kon Tum wooden church stands on Nguyen Hue Street of Kon Tum city. Apart from the main building, it has also a 25m tall Cross Tower, a reception house, a showroom exhibiting ethnic and religious products, a typical local tribal communal house, an orphanage, a brocade weaving and sewing shop, and a carpentry workshop. In the church’s garden, there is a statue of Virgin Maria holding newborn Jesus, made of a single log in the rustic style of Tay Nguyen ethnic tribes. 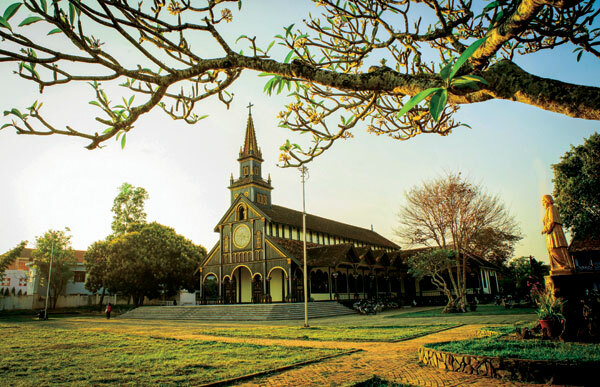 Culturologists say that Kon Tum wooden church was designed and built in Roman style combined with elements of Tay Nguyen stilted house architecture. During Christmas, the minority parish artisans use timber, brocades and tree bark to decorate the wooden church in typical Tay Nguyen colours and motifs. 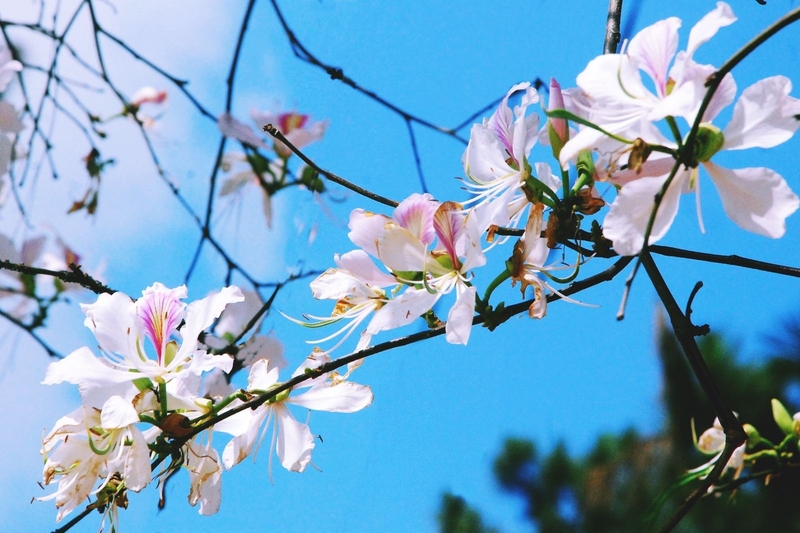 In the outdoor space they plant many festive trees – a spiritual symbol of Tay Nguyen peoples’ life. On High Masses, multitudes of people of Ba Na, Xe Dang, Gia Rai, Ro Mam, B’rau and tribes from deep mountains come to receive God’s grace and blessing. They fill up the church’s 7000m2 premises. Not far away from the wooden church is the Kon Tum seminary constructed during 1935-1938 by the first bishop of Kon Tum episcopate. Built from precious wood and stones, the seminary has the same style as the church but is much bigger. The upper floor of the seminary has a showroom exhibiting the missionary history of Kon Tum since the mid-19th century, personal items and handwritten documents of priests and missionaries, and images and texts related to the establishment and development of Kon Tum episcopate. Meticulously carved in wood, items showcased at the seminary are very valuable. This can be considered as a small museum of life utensils, farming tools and cultural artefacts of the ethnic minorities living in this province. Lựa chọn địa chỉ khách sạn tại Bãi Cháy uy tín!